Local anti-hunting activists are taking aim at a proposal to expand a deer hunt in Tyler State Park, and the local media has been helping their cause by publishing petitions and anti-hunting resources in their coverage of the issue. Hunting advocates need to make their voices heard in the debate as officials come closer to a final decision. Tyler State Park is a 1,711-acre park in Newtown Township and Northampton, and the current proposal looks to expand what is now a one day shotgun hunt in order to keep deer populations at more manageable levels. According to reports, regional park managers have said that “biologists, foresters and other experts do frequent checks at Tyler and other state parks and have found that deer are causing extensive plant damage at Tyler, a situation that throws off the ecological balance at the park.” Wildlife professionals believe opening the park to limited archery hunts to supplement the one day of shotgun hunting will help reduce the populations to a level the park can sustain. As it stands, the proposal would open 400 acres of the park north of Dairy Hill Trail to a maximum of 10 hunters during archery season. 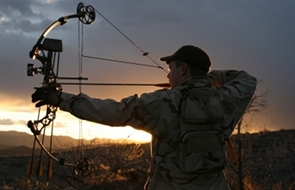 Hunting would be allowed from 30 minutes before sunrise to sunset. Officials are also debating whether to open a more limited hunt for only a few days or weeks during archery season. State parks have long accommodated by hunters and non-hunters recreational users alike. Officials say that archery hunts occur in more than 90% of state parks, including another Bucks County location in Bensalem. Safety has never been a problem at area parks, even when the hunting area is limited to a smaller plot of the park, as is the case in Neshaminy State Park. At Neshaminy State Park, archery deer hunting has been allowed for the last five years in a 130-acre portion of the 340-acre park. The hunting area is located entirely within Bensalem, said park Manager Josh Swartley. A maximum of five hunters are allowed into the park every day but Sunday during archery season, he said. Signs are posted, but non-hunters also are allowed into the hunting area, he said. There have been no hunting accidents at the park, said Swartley, who added he does get complaints from non-hunters who feel they shouldn’t have to see dead deer being taken out of the park. Since the hunts started five years ago, only 53 deer have been killed at Neshaminy, including only five last year, Swartley said. But it’s been enough to help reduce plant damage, he said. In addition, hunters who have organized online have started their own petition. However, given the head start anti-hunters have on the process, and the fact that the park’s staff have said they have overwhelmingly heard by the region’s anti-hunting forces, it is important that you contact park staff directly.